In the afternoon we will pick you up from your hotel, will take you to the city’s main historical, religious, and contemporary sites. The tour starts at the Huaca Pucllana ruins in the Miraflores neighborhood. The structure is an enormous adobe pyramid dating from the 4th century A.D. which still stands amidst Lima’s most modern district. Next, you will go to Lima’s historic center, a UNESCO World Heritage Site. 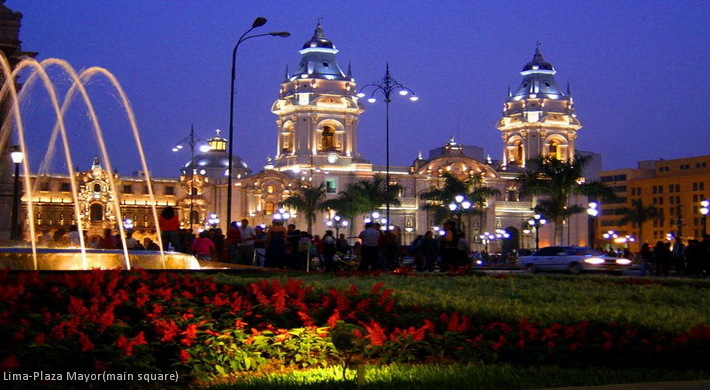 Here you will admire the Plaza Mayor (the central square), which is surrounded by 5 important buildings: the Government Palace, the Cathedral, the Archbishop´s Palace, the Municipal Palace, and the Palace of Lima. You’ll then travel a few blocks to the San Francisco Monastery, famous for its catacombs where over 250,000 bones rest. Your tour of Lima will end with a visit to the traditional residential areas of the city, including San Isidro, Miraflores, and the Larcomar complex that overlooks the Pacific Ocean. you will stop briefly at the Parque del Amor (very popular with couples on St. Valentine´s day). At the end of the services .Transfer to your hotel.